Source: Produced in E. coli. Catalytic domain (aa 497-663) of human hGCN5L. Formulation: Liquid. In 20mM sodium citrate, pH 6.0, containing 0.25M NaCl, 1mg/ml BSA and 10% glycerol. Specific Activity: ≥200 pmol/min./µg assayed as production of CoA-SH from AcCoA in the presence of a peptide comprising human histone H3 residues 5-23. CoA-SH is determined with a fluorogenic, thiol-reactive maleimide (CPM). Scientific Background: hGCN5L is the catalytic histone acetyltransferase (HAT) subunit of the transcriptional coactivator complexes STAGA and TFTC. 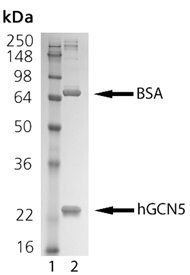 SDS-PAGE Analysis: Lane 1: MWM; Lane 2: 1.0 ug of purified GCN5 protein, with 1 mg/ml BSA.